The following post contains affiliate links and is sponsored by CosmoLiving. Read my full disclosure here. I have been eagerly waiting to update our bedroom since we moved into this house. We have had the same dresser for seven years. I updated the knobs a few years ago. It was just time to pass the dresser on to my daughter. This master bedroom also is a lot bigger and needed a few more pieces to fill the room. I was beyond thrilled to be able to work with CosmoLiving on this project. A before picture of the bedroom when we bought the house. CosmoLiving is the new home line by THE Cosmopolitan. Have you heard of that major magazine? Yeah, kind of a big deal. Guess what? The CosmoLiving home line is also a big deal. Think chic and modern with a touch of feminine. Golds, velvets, blush, and all the trendy furniture pieces and accents you will love. I was drooling over every piece. When I saw the Westerleigh 6 Drawer Double Dresser, I knew it was meant for my bedroom. The white and gold details are just perfection. Look at those cute gold dipped legs? I can’t even handle it. 🙂 The lamp is also a favorite with its beautiful marble color. The gold accent detail is the perfect pop. CosmoLiving really put thought into all the little details. I am so impressed. I have been eyeing one of these round Marble and Wood Sculptures. It’s just so versatile and a great staple in styling. The sculpture is classy and modern while adding a fun artistic element. An affordable statement piece that really is beautiful. The wood and marble combo is hard not to love. Who needs a bench when you can have the whole sofa? Go big or go home people. This elegant velvet goodness is just what the end of my bed needed. Where do I even start with this Neptune Chesterfield Sofa? The tufting in this beautiful gray velvet is nothing short of glam. Again, the gold dipped legs just get me every time. I have all the heart eyes. The hardest decision with this sofa is picking a color. This sofa also comes in the most stunning green color that will make any room sing. My bedroom finally feels like home (minus the carpet that will change soon). Thanks to CosmoLiving by Cosmopolitan. The line is fun, fearless, and fabulous. From furniture to accents, every piece is thoughtfully curated to give you that classy, glam look at an affordable cost. The following post contains affiliate links and is sponsored by Hunter Fan Co. Read my full disclosure here. There are two things Mr. Whitelane requires in a house. A fan in the master bedroom and a fan in the living room. I guess it’s a guy thing? He really can’t sleep at night unless he has a ceiling fan circulating the air. Mr. Whitelane also loves to have a fan in the living room to circulate air as well. I swear he would have one in the kitchen too if I didn’t care. Luckily our new house had a ceiling fan in both of the mandatory places. However, both of the fans were builder basic, drab, and not very stylish. You can see what I mean in the picture below. I knew those fans had to be swapped out and where to find new ones. We had a few Hunter fans in our previous home and I just loved them. Hunter Fan Company is one of my favorite sources for ceiling fans. I am telling you they put style and function into one of the best fans you will use. I was browsing itsaHunter.com and I found so many fans I wanted. There really is a ceiling fan for just about any style or room design you can think of. In fact, I am now wanting to put a fan in all the kid’s bedrooms as well. The Dempsey was so great in our last house that I decided to use it again for our living room. I wanted to take it up a level and go with the low profile Dempsey this time. We only have nine-foot ceilings and it fits perfectly in this room. By the way, it has a remote and the light is dimmable! We have a baby and I love being able to dim the light when it is getting close to bedtime. Also, Mr. Whitelane is on cloud nine walking around with the remote to control the fan. He loves how easy and convenient that feature has been. The master bedroom got its own little piece of ceiling jewelry with the Symphony. The simple modern lines were calling my name as soon as I saw it. I wanted something that blended in with the aesthetic of the room and didn’t look like a heavy piece of equipment hanging from the ceiling. The advocate met all my criteria and it is a Wi-Fi enabled smart fan. That’s all I had to say to Mr.Whitelane and he was sold. The Symphony is part of Hunter’s line of SimpleConnect smart fans that is so easy to use. It even pairs with our Alexa device. I love laying in bed and controlling the fan and light from an app on my phone. It has saved me many trips to the light switch. The Symphony also comes with a remote. It is so convenient to have access to control the fan right from my phone or the remote. Both ceiling fans have been so much quieter too. The previous builder basic fan made quite a bit of noise and drew a lot of the wrong kind of attention. 🙂 Mr. Whitelane proudly tells people #itsahunter when they ask about our new ceiling fans now. I can’t help but laugh. At least he has his two requirements for this house. Hunter has made ceiling fans a stylish feature that leaves me wanting one of their fun designs in every room. Don’t even get me started on how cute their outdoor line is. Mr. Whitelane may be getting more of what he likes in every single room! Today I am giving you a sneak peek into the master bedroom at the new house. I thought it would be fun to show you some of the plans we have for the space. There is a short list and a long-term list for this room as well as the rest of the house. To be honest, I am not sure this room is even on the shortlist. 🙂 I will probably start on the main floor and work my way up with projects. Nonetheless, I am sharing our big and small plans for our master bedroom. The main thing I love about our bedroom is the size and natural light. Look at all those windows! Well, they are great for photographing but not so much for sleeping. Definitely going to need some blackout curtains. All the natural light flowing in makes this room feel bright, big, and open. It also helps that the size of the room is pretty large to start with. In fact, I believe it is the largest master we have ever had in our marriage. A ton of space to work with. All these photos of the bedroom are from the previous owners with their furniture. Bear with me on my doodles and preliminary design ideas. They are very rough and just a fun doodle to give you the gist. I know, I know….I should have been an artist. 🙂 The shortlist for this room begins with easy updates. I will be swapping out the fan for a lower profile fixture that is neutral and fits my color scheme. Next, I will get my large tufted bed centered between those two small windows. Beneath the windows, I will be putting large nightstands that fit the width of the wall better. All the windows will be getting curtain rods and curtains. Then a large area rug will go beneath the bed and extend out under a large bench at the foot of the bed. I am also thinking a large full-length mirror leaned against the wall by the door. The other wall not shown in the pictures will have a dresser. That same wall has the entrance to the master bathroom. The long list includes getting rid of this carpet. Someday I would like to replace it all with a luxury vinyl plank flooring (way down the road). Carpet and kids just don’t mix at my house. I would also love to swap out the blind for shutters or custom roller shades. Finally, fill all those walls with a lot of trim work. Most of the changes are cosmetic and easy. Once the short list items are finished, I think that will have the biggest impact. Furniture and lighting can have a huge effect on a room. Lucky me, the walls are already white! Can’t wait to show you more soon. Our builder wanted to charge us a couple hundred dollars to have a door from our master bedroom to the bathroom. Otherwise, it would just be an opening. There was no way I was paying to have another basic door like the rest of the house. Having a door open into the bathroom from the bedroom would be a waste of space too. I opted to leave it as an opening and I would add my own barn door later. 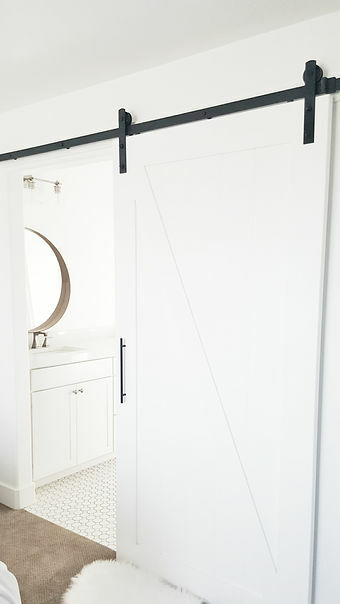 The barn door would save space and be way cuter! I started looking for barn doors and hardware. I could not decide what style I wanted, from the door to the hardware. I looked for months trying to find the perfect style and price. Well, I found pieces of what I wanted here and there but they were way over priced. Then one day I was at my second home, Home Depot. Strolling the aisles I came across their selection of barn doors. I found this Masonite Knotty Alder “Z” barn door. It needed some adjustments but I knew I could make it work. At $499 for the door and hardware, I was sold! Plus, I had a coupon. We loaded up this bad boy and brought it home to get to work. I loved the planks and face of the door. I didn’t love the knotty alder wood. 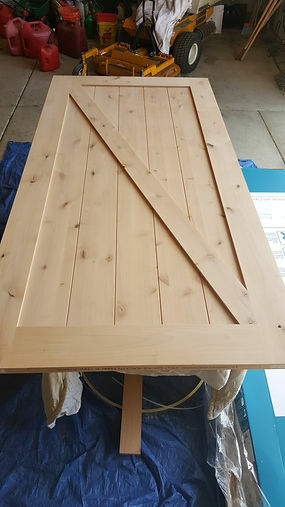 The door comes unfinished so you can paint or stain it. I knew I wanted it white. Shocker! 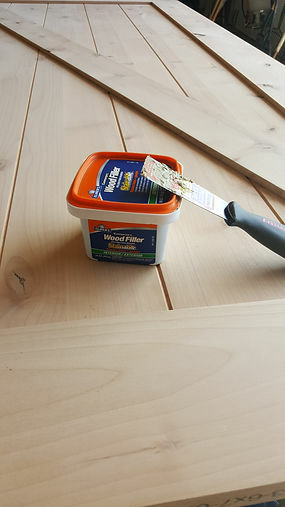 I did not want all the knots to show up so I filled them with wood filler. One side at a time. Once it was dry, I sanded them down smooth. Now, we had a nice smooth wood surface to paint. I got out my favorite spray can primer, KILZ. I attached my spray gun nozzle (so my finger wouldn’t die) and started spraying. I used the same method as in my video tutorial. After the primer dried, I gave it a fine sanding with 180 grit sandpaper. I flipped the door over and did the same thing to the other side. 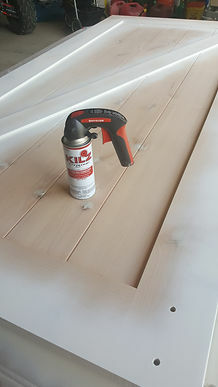 I used a compressor to blow off all the dust from sanding. I also took a clean rag and wiped down both sides really well. Now I was ready to paint. I really wanted to use Krylon spray paint for the door too. It is just so easy and quick to use. However, I decided to match the paint with the other doors and trim. Sherwin Williams was having their big 40% off paint sale. Talk about good timing. I grabbed a gallon of semi-gloss “High Reflective White.” I do have a paint sprayer but I hardly ever use it. It is a lot of work and sometimes just a pain. It had to be done, so I busted it out. I even made a little video, just for fun. I got a 1x4 solid wood primed header piece to attach the hardware and door to the wall. I sprayed the header while I was spraying the door. I did not love the handle that came with the door. I found this one at Lowe’s that matched our house better. Our awesome contractor hung the door for us and I am loving it!